India’s 38th tiger reserve and Kerala’s second was open by environment and forests minister Jairam Ramesh. It would be known as the Parambikulam Tiger Reserve. There has been a sharp decline in the number of tigers in India, with only 1,411 of them left, according to official estimates. The tiger reserve was known as the Parambikulam Wildlife Sanctuary when it was set up in 1973 in a 285-sq-km protected area in Chittur area of Palakkad. Another 358 sq km of forests were added, and the tiger reserve now has an area of 643 sq km. It has a rich diversity of animal life. It also has a variety of trees, including teak, neem, sandalwood and rosewood. 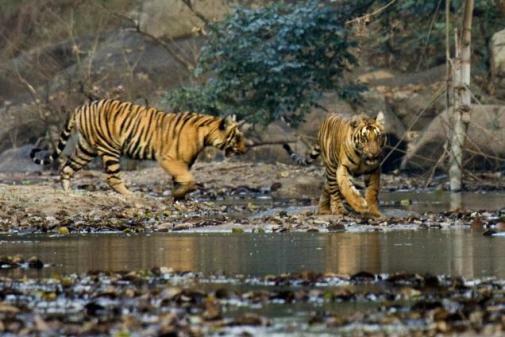 Kerala’s first tiger reserve — Periyar Tiger Reserve — is situated in Thekkadi in Idukki district. One of the finest bird parks in the world, Bharatpur Bird Sanctuary (Keoladeo Ghana National Park, in Bharatpur, Rajasthan India) is a reserve that offers protection to faunal species as well. Nesting indigenous water-birds as well as migratory water birds and waterside birds, this sanctuary is also inhabited by Sambar, Chital, Nilgai and Boar. It is visited by a large number of visitors since it is on the tourist circuit of Delhi-Agra-Jaipur, and also visited by photographers wanting to capture birds in all their glory. More than 300 species of birds are found in this small wildlife park of 29-sq-kms of which 11-sq-kms are marshes and the rest scrubland and grassland. Keoladeo, the name derives from an ancient Hindu temple, devoted to Lord Shiva, which stands at the centre of the park. ‘Ghana’ means dense, referring to the thick forest, which used to cover the area. Bharatpur Bird Sanctuary is famous as an ‘Ornithologist’s Paradise’. The sanctuary is the only manmade wildlife sanctuary in India, developed by an erstwhile Maharaja of Bharatpur. The sanctuary covers an area of approximately 29 sq km, 10 sq km of which comprises of fresh water marshes, shallow lakes and bogs. 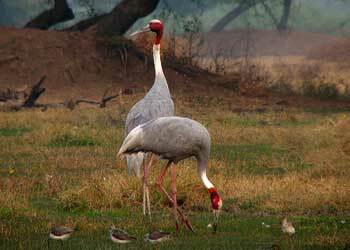 The favorable environmental conditions combined with enough nutritious food for the birds at Bharatpur Bird sanctuary attracts thousands of indigenous as well as migratory birds every year including the world-renowned Siberian Cranes. The park houses more than 300 species of birds and is spread over 30 square kilometers. It is the perfect place to introduce your child to the wonderful world of animals and birds. The migratory birds arrive by August and leave in February. You can find several species of Cranes, Pelicans, Geese, Ducks, Eagles, Hawks, Shanks, Stints, Wagtails, Warblers, Wheatears, Flycatchers, etc. The migratory birds include the Coot Snipes, Spanish Sparrow, Red Crested Porhard, Rosy Pelican and Flamingo. The star of the show is, however, the Siberian Crane. You can also find many mammals and reptiles in the park apart from birds. Pythons, Sambhars, Jackals, Otters, Spotted Deer, etc. are some of the other inmates here. Bharatpur Palace : Not far from the museum is the Bharatpur Palace, an marvellous structural blend of Mughal and Rajput architecture. Bharatpur Government Museum: One of the major attention grabber after the Bharatpur sanctuary is Government Museum of Bharatpur, which provides a glimpse of the past royal splendour of Bharatpur. Bharatpur Wildlife Sanctuary is open throughout the year, still the ideal visiting months are from August-November for resident breeding birds and October- February for migrant birds. There are well-defined forest trails, which can easily be covered on foot or on a cycle or you can also hire a rickshaw that are available on hire. An early morning boat trip or a late evening one is quite a rewarding experience to check out the hidden surprises of Bharatpur. The sanctuary is located in east Rajasthan just 50 kilometers from Agra and can make for an ideal weekend vacation. You can get to Bharatpur by bus (operated by the state transport and private operators) from Delhi, Agra or Jaipur. Bharatpur also has a train station in case you decide to get there by train. It connects to all the major cities in India like Delhi, Mumbai Jaipur and Agra. The nearest airport is situated in Agra. You can also get to Bharatpur by road as an excellent network of roadways connects Bharatpur to all the major cities. 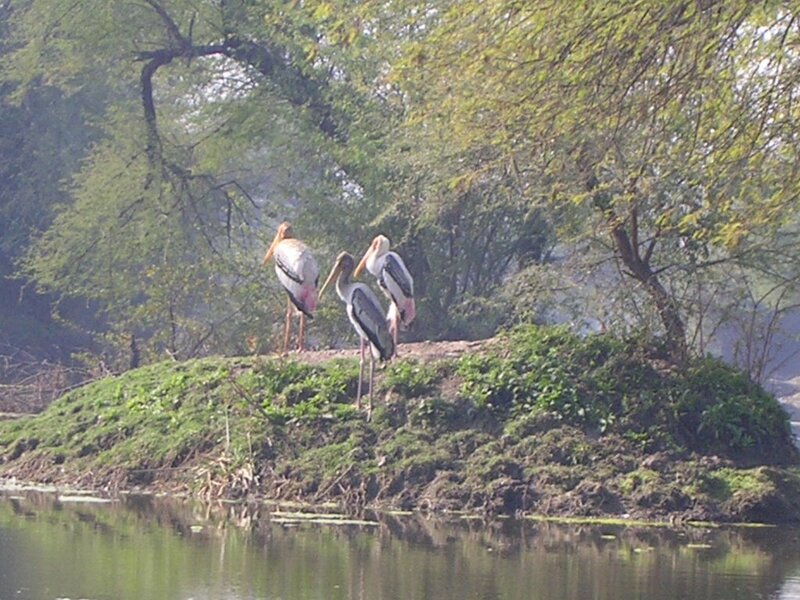 Bharatpur has a very tropical climate as is located on the fringes of the Thar Desert. Wear light cottons during the summer and woolens during winter. rest houses, lodges, dormitories and hotels. Rajasthan Tourism provides good accommodation at its hotel, ‘Saras’. Inside the park, the Bharatpur Forest Lodge is maintained by the ITDC. Shanti Kuteer, Circuit House, Dak Bungalow are also good for a comfortable stay. Park Palace, Govind Niwas and the Tourist complex are the other choices.